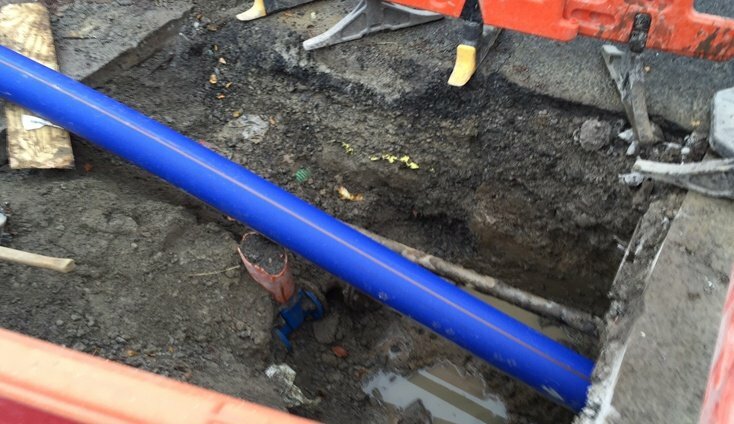 The project brief from Irish Water was to replace an 850m stretch of existing 100mm cast iron pipe with a new 180mm SDR11 profuse pipe at Station Road, Portmarnock. Carty Group Ltd was subsequently commissioned to complete this project and decided that given the constraints on the urban site, pipe bursting would be the safest and most efficient method of replacing the water main. Following an enquiry from Carty Group, Groundforce recommended using the Hammerhead Hydroburst HB5058 system, a model selected from their pipe-bursting fleet and designed for the replacement of failing or undersized gas, water and sewer lines: the HB5058 offered Carty a reliable and cost effective solution. The pipe replacement involved working around a busy commuter route with a temporary single lined traffic management system in place. The protection of footpaths, paved areas and the proximity of existing services meant it was vital that all works be undertaken with utmost diligence and minimal disruption. Additionally, it was decided that pipe bursting should be progressed in 50m incremental sections to avoid the risk of ground heave. In some cases, pipe bursting offers a more cost effective and greener alternative to open cut trenching for gas and water main replacement, with strikes to live services and disruption to the local area significantly reduced. Pipe bursting utilises the corridor of the existing utility, thereby reducing excavating and backfilling activity and avoiding further congestion of underground services. The HB5058 is designed for 50mm – 250mm gas and water main replacement with a typical 100m line replacement job possible in as little two hours. Groundforce’s full range of pipe bursting equipment facilitates pipe replacement of up to 500mm. With Irish Water now beginning to tackle the issue of water conservation, we believe that pipe bursting; along with other trenchless technology methods, will become a more popular technique within urban areas.